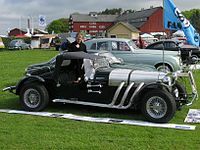 The Excalibur automobile was a car styled after the 1928 Mercedes-Benz SSK by Brooks Stevens for Studebaker. Stevens subsequently formed a company to manufacture and market the cars, which were conventional under their styling. A prototype premiered at car shows in 1964, fitted on a Studebaker chassis and using a 290-horsepower Studebaker 289 V-8. Studebaker almost immediately ceased its operations, ending the availability of that engine. Stevens subsequently obtained engines from General Motors through his friends, GM executives Ed Cole and Semon "Bunkie" Knudsen. These were Chevrolet 327s in 300-bhp Corvette tune, making the 2100-pound Excalibur a strong performer. With the standard 3.31:1 rear axle, acceleration from 0-60 mph took less than six seconds. Projected top speed was 134 mph. Over 3,500 Excalibur cars were built, all in Milwaukee, Wisconsin. 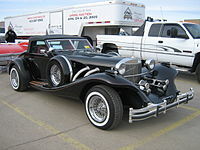 The American comedian Phyllis Diller was a notable proponent of the Excalibur automobile, and owned four of them. The company failed in 1986 but was revived several times. Production of the Excalibur continued until 1990. ^ "Brooks Stevens, 83, Giant in Industrial Design". The New York Times, John Holusha, January 7, 1995. January 7, 1995. ^ a b "1964 Excalibur SS Pictures, History, Value, Research, News". Conceptcarz.com. Retrieved 15 May 2018. ^ "How Excalibur Cars Work". Auto.howstuffworks.com. 11 June 2007. Retrieved 15 May 2018. ^ "1967 Excalibur Series I SS-SSK Roadster full range specs". Automobile-catalog.com. Retrieved 15 May 2018. ^ "Excalibur History". Conceptcarz.com. Retrieved 15 May 2018. ^ "Is Third Time The Charm For Excalibur?". Articles.chicagotribune.com. Retrieved 15 May 2018. ^ "Camelot Classic Cars, Inc". Excaliburclassics.com. Retrieved 15 May 2018. 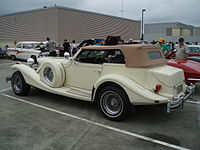 Wikimedia Commons has media related to Excalibur vehicles. Preston, Alice. The Excalibur story. This article about a classic post-war automobile produced between 1945 and 1975 is a stub. You can help Wikipedia by expanding it. This page was last edited on 1 February 2019, at 22:43 (UTC).